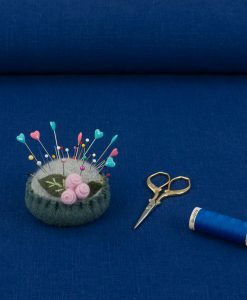 Oh my dear fellow Thread Heads! 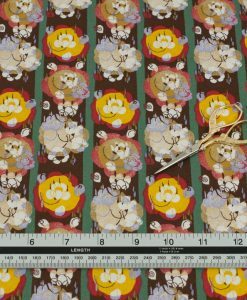 I am going to gush for a few sentences or two about this stunning fabric! 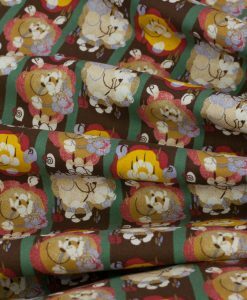 I absolutely love the colour, drape and hand of this print and I can picture it making the perfect kimono top or summery dress or blouse. Perhaps you’re seeing lovely dressing gown (that’s a bathrobe to all you Americans out there!) I absolutely cannot stop looking at this print every time I go into Thread Heads HQ. 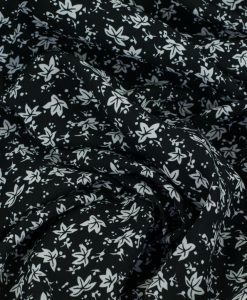 This print is subtly textured and just so lush. 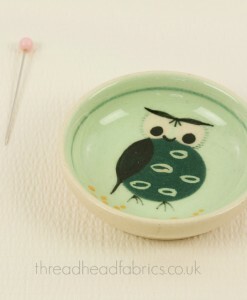 Team this up with a Sew Over It Doris Dress pattern or a 1940’s Tea Dress for something really special! 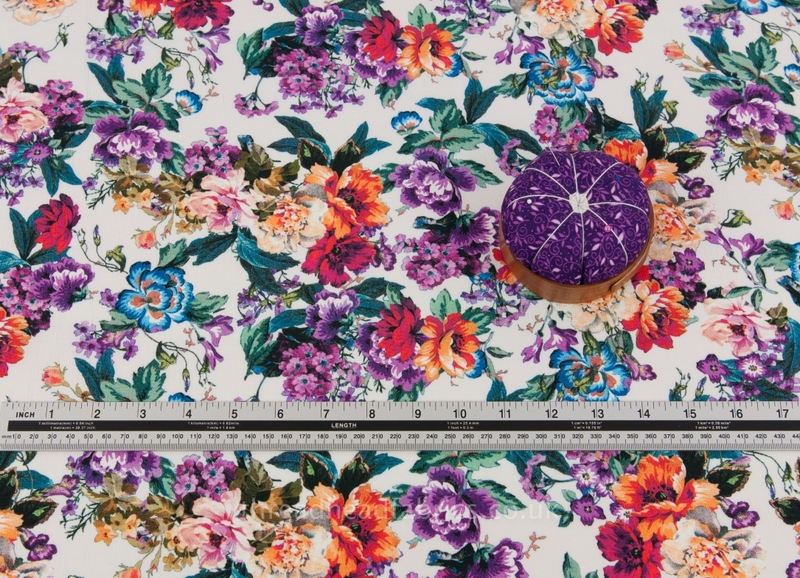 The fabric is 145cm wide and at £6.50 per metre it’s great value for money! Have a look at the fashion magazines or high street shops lately and you’ll notice all the glorious floral prints showcased in many designer fashions. 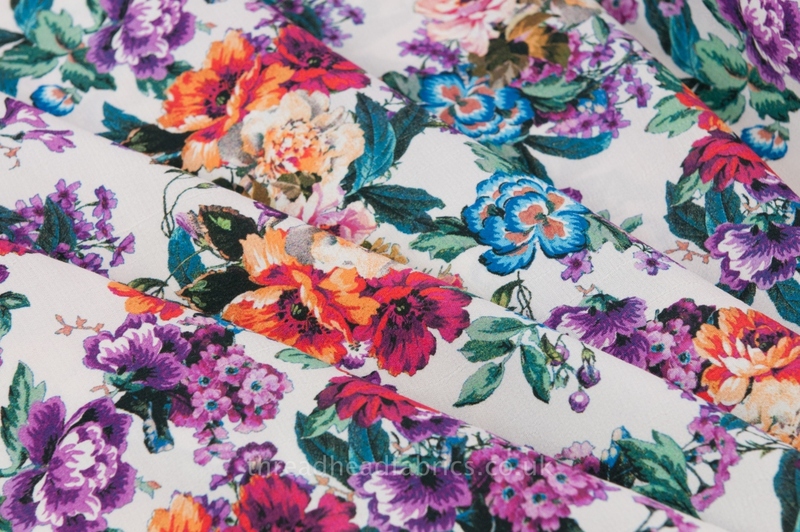 Florals are appearing in clothing for all seasons and who doesn’t need a bit of something bright and beautiful every day of the year? Recently I bought a pair of floral shoes and the very trendy millennial at the till admired my shoe purchase and said, florals are everywhere this year! 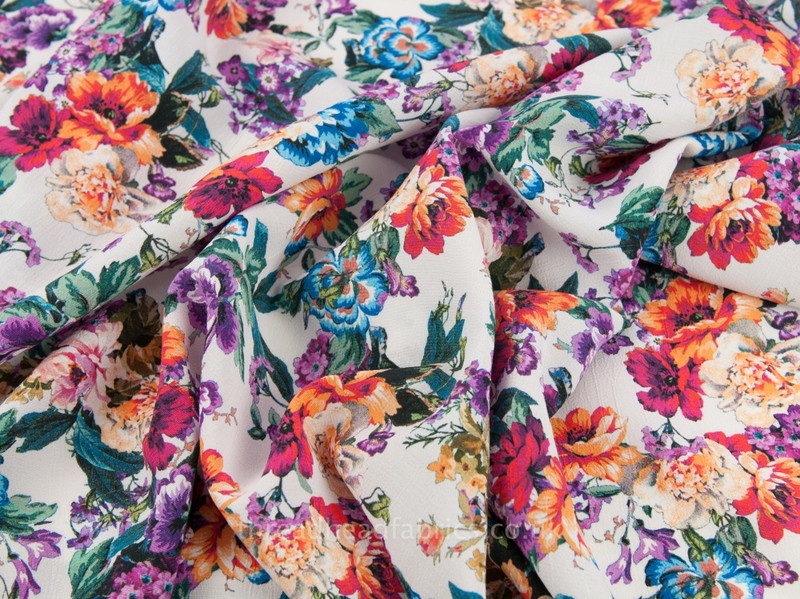 Even if you’re not exactly one to be a slave to fashion trends, you can never go wrong with a classic floral print. 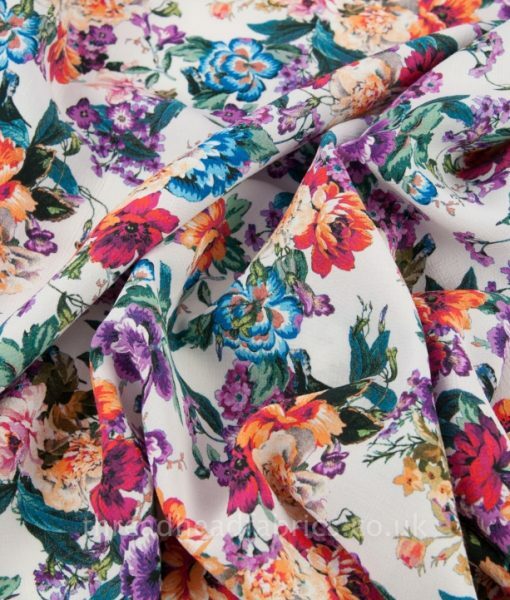 If you’ve got a special event coming up or if you are looking to breathe some fresh air into your work wardrobe, then florals are a way to go! 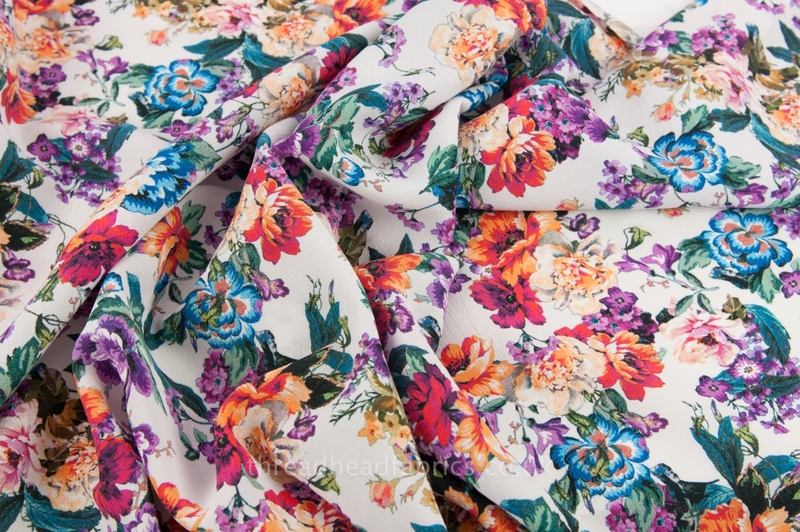 The colours in this print would make it work for the spring, summer and fall. So why not make yourself a dress or skirt that is sure to become a go to staple in your wardrobe. 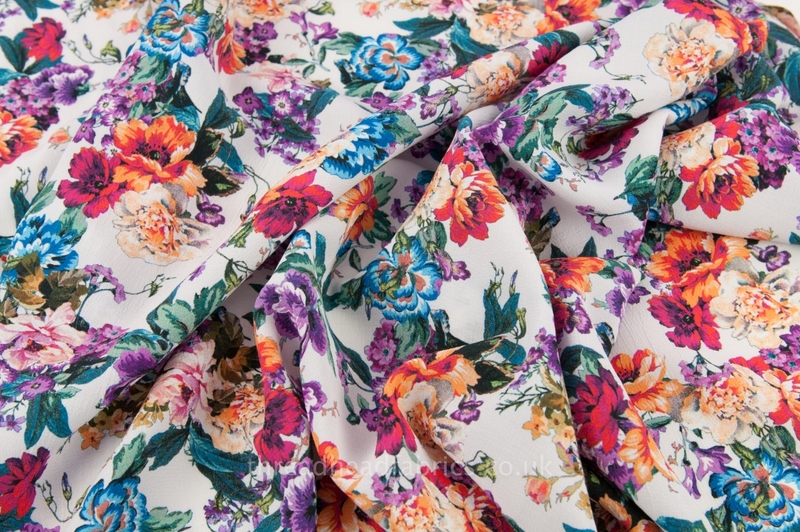 Our bright, floral viscose fabric has a hint of classic Japanese kimono fabrics. 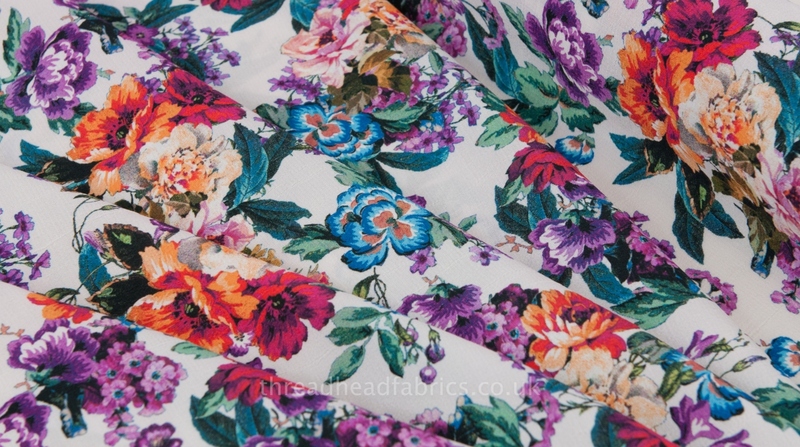 So why not have a go at creating a gorgeous kimono or slinky night dress with this lovely fabric. 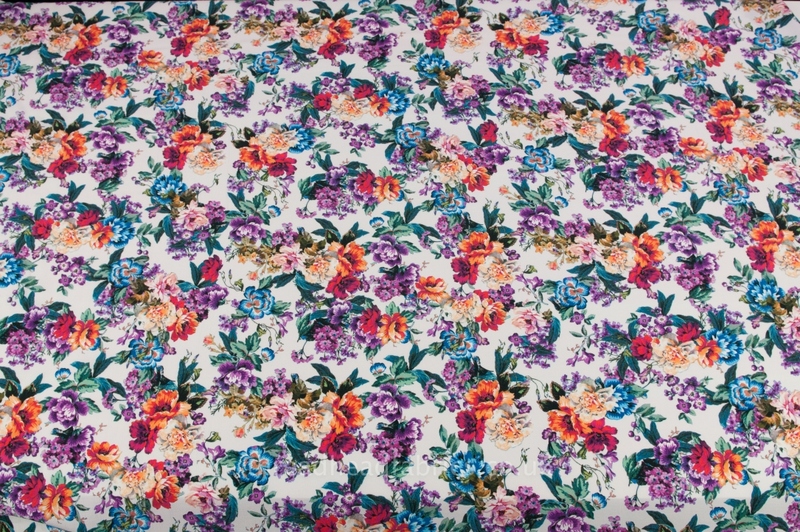 We got the chance to grab some of this beautiful fabric from our London based wholesaler at a fab price! 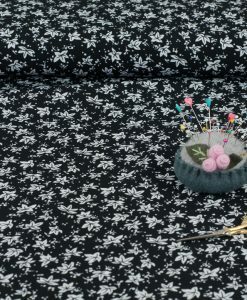 Our newest wholesaler is a fabric supplier to the likes of The Great British Sewing Bee and the London 2012 Summer Olympics so we trust the quality of their fabrics. 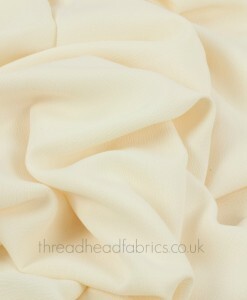 Suggested washing instructions: Machine wash in cold water on a gentle cycle or hand wash. Tumble dry low or line dry. Do not bleach. Do not dry clean. Only iron if needed on a very low setting and iron on the reverse of the print. 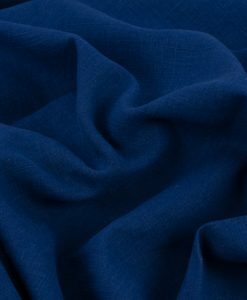 Thread Head Fabrics recommends you pre-wash your fabric before you start your sewing project as all fabrics can shrink slightly when washed.